This topic contains 5 replies, has 5 voices, and was last updated by Joemanji 1 year, 1 month ago. Hello and welcome to the first What’s The Play? 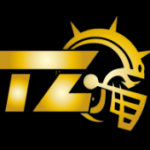 at our new home of The Tackle Zone! The premise is simpler than a Stone Troll’s playbook – tell us what you would do in the situation pictured below. The score is 0-0; you are the Amazon team and it is the start of your second turn of the second half. All Improvements and skills are marked. This is a nice tricky one to start us off Joe. Spent about 10 minutes looking at this already and still unsure what is best. 8/10 Amazons being tagged up with those wide ghouls threatening to hunt down the ball carrier means the pressure is on super early in this drive. Feels like I need to make a run for the relative safety of O8 and then use the free amazon player to help free up some others, but still working out how! Depending on block dice O6 likely ends up surfing the wight or ghoul and the rest of team dodge out of contact to provide cover and assists for 2d blocks. This reply was modified 1 year, 1 month ago by Spencer Lawrence. Ball carrier moves to Q2. Free Linewoman at P8 moves to Q4 for the assist. Linewoman at O4 now has a 2db on the Wight at P3, chaining into the Ghoul pushing it to O1. Follow up regardless of result. If the Wight is standing then the Linewoman at Q3 has a 2db and will follow up. If the Wight is knocked down then the Linewoman at Q3 can surf the ghoul. By taking it to the top side you remove most of the danger. The weakness of the slow Undead team is that with the fast players wide on both flanks they will find it hard to get support in the next turn. The Ghoul at Q12, for example, cannot reach the ‘2’ row for a blitz. Also if the Amazon Linewomen end up on P2 and P3 even if the Wight was not knocked down you are looking at best a 1db on the blodge ball carrier. And even if the Ghoul finds the POW they will find it hard to get the ball safe on their turn (as they cannot pass or hand off to the other one even if they pick it up). Meanwhile if things go well for the Amazons then the Ghoul and Wight on I12 and L12 will be scrabbling back across field to put up some sort of defence. I’d leave the Linewoman at O6 where they are to soak the Mummy for a turn and the Blitzer at N8 to tag the Zombie to tie that up as well (if no rr used it is even worth a 1 die nibble here). It may even end up being something like 6v4 numbers wise in favour of the Amazons as they drive up towards the top side of the TD zone. This is hard. Initially i thought the logical thing would be to move quite centrally and use the space near the spare ‘zone on P8. However, I think I, as above,would push for a flank to avoid getting totally swamped. It relies heavily on some POWs though! Lets assume he is POWed, so Q3 can block the Ghoul, pushing to O1, following if he isn’t knocked down. P8 then moves to P5 to cover the front and then I would dodge Q10 to complete a nearly cage, at R5. After that its pretty tough. I’d be tempted to dodge Q13 out, but I’m not sure where to, perhaps to tag the ghoul on Q12, perhaps to assist the block at N9. Probably the latter which I would then may make a blitz to release the linesman to help perhaps at R4. Fairly conservative I think, but a sticky situation for the zons for sure and I’ve probably got my number codes in a total mess. This reply was modified 1 year, 1 month ago by Dan. This reply was modified 1 year, 1 month ago by Dan. Reason: I don't know what all the page breaks have been included sorry, don't seem to be a able to delete! Interesting one, this. Plenty of troublesome contact to deal with for the Amazons. Ball carrier blitzes, moves to R12 and hits the ghould with 2D, using one gfi (to get out of range from the wight and ghoul on the other side. Zon at N9 blocks, 2 dice on zombie. Zon at O6 dodges out and moves to M11 (if zombie is down) or M12 (if zombie got pushed). If we survived the first 2 dodges, we do one more. Blitzer on N8 dodges out and moves to I11. 2 dice block on the ghoul. A pow here is golden, but if only a push we push him forward to H11, getting the ghoul our of harms way. The 2 remaining Zons stay put. Taking a hit from a mummy. And the wight. Now I realize this might leave the Undead a chance for 2 dice on your BC (move in zombie, blitz from the inside with the ghoul, assuming we didnt hurt the first Ghoul. Even if we do go down, however, I figure we are in a good position to rewin possesion and we have plenty of possibilites for progression and screening up the leftern side where we now are in control. Hitting 3 weak positionals in this turn could take out one and build our numbers advantage. 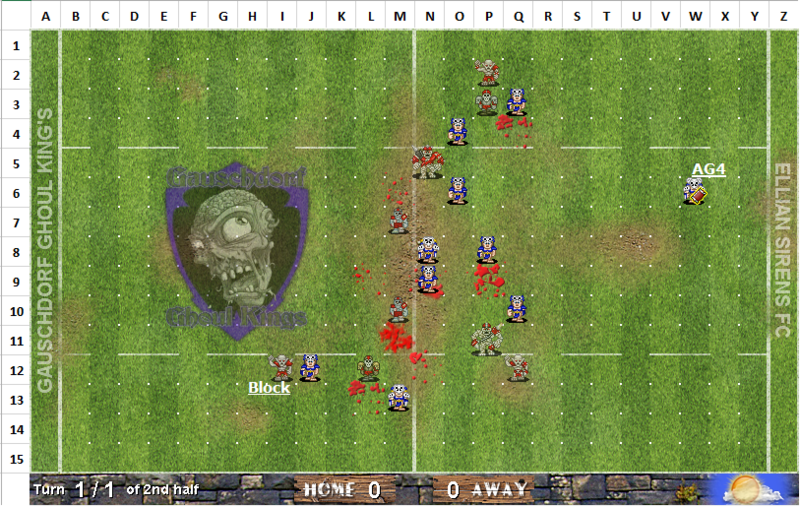 We also leave the Undead with the problem: Go all in for the ball, or try and regroup to defend the “lost” flank.